Hands On Bike: Part 6: Cheap Bikes vs Premium Bikes: What is the Difference? Part 6: Cheap Bikes vs Premium Bikes: What is the Difference? 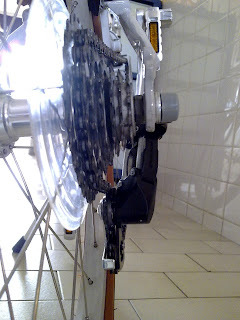 A useful feature of modern bicycles: The gear systems on the bike! With multiple gears, it allows you to make use of mechanical leverage to pedal efficiently on all sorts of terrain. However, what use is so many gears if you cannot switch between them easily? And here is where the gear shifting system comes into play. The modern gear shifting system is engineered so that you can select your preferred gear quickly, easily and accurately. In fact, the gear shifting system is one of the most highly engineered and complicated system that can be found on a bicycle. So how many gears are enough? The answer depends on your type of usage for the bike! For the Aleoca R2R and the Dahon MuP8, they are equipped with a single chainring up front, and multiple gears in the rear. 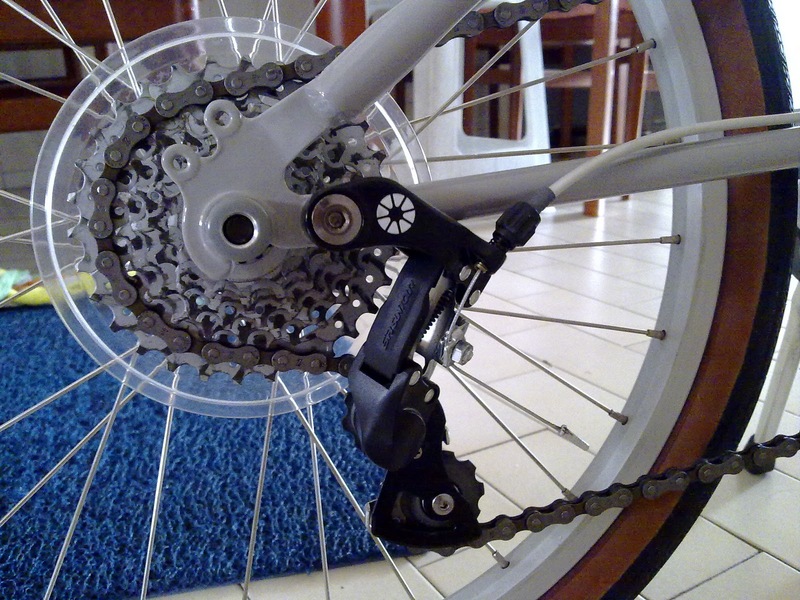 This is the most common gearing system found on folding bikes. Front gearing systems are not so common on folding bikes, because there is less need for it, unlike mountain bikes that need many gears for very varied terrain, or road bikes that seek speed with high gear ratios. What constitutes a gear shifting system? 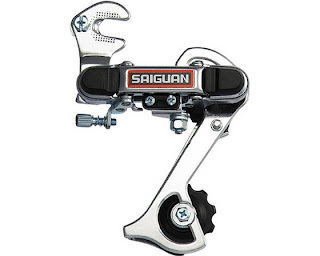 A rear derailleur. The one shown here is a gold version of the Ultegra 6700 RD. A rear shifter. 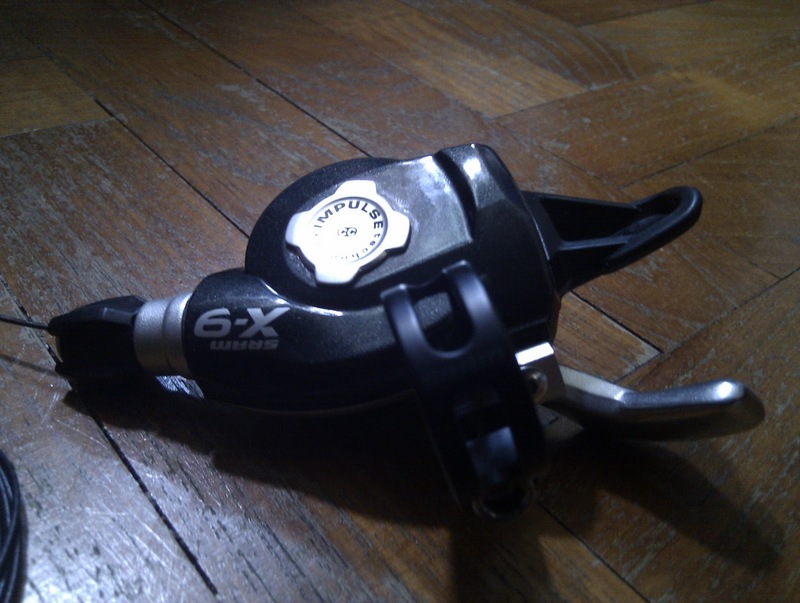 This is a SRAM X9 mountain bike shifter. A cassette. 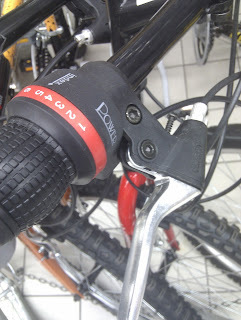 This is a 7 speed cassette, stock from the Dahon Boardwalk D7. A good gear shifting system will require all these components to be compatible with each other, in order to give a crisp and accurate shifting performance. Beginners usually get confused with all these different compatibilities, and the more questions they ask, the more confused they get! I shall try to explain the details in simpler terms, with minimum jargon for maximum understanding. After that, we will compare the gear systems between the Aleoca R2R and the Dahon MuP8, and see if the gear shifting system is worth the significant price difference. Let's start with the cassettes. 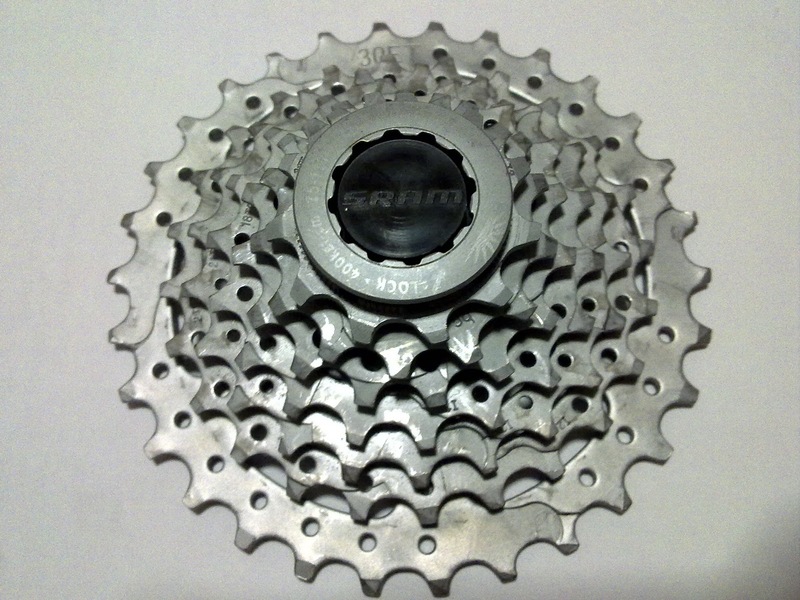 The cassette refers to the bunch of gear sprockets found on the rear hub of your bicycle. The more sprockets there are, the more speeds you have! However, you will realise that even though the width of the rear hub does not change, how can they fit less or more sprockets in the same amount of space? There are 2 ways to fit a cassette onto the rear hub. The previous post on wheels and tires explains the differences between a freewheel and a freehub. 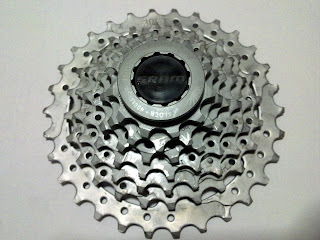 For a 6, 7 or 8 speed cassette, the spacing between sprockets is quite similar, but not exactly the same. The thickness of the sprockets can also differ between different models or different brands, and across different speeds. Even so, the wide dimension tolerances means that they can use the same chain without big issues. One way to think of it is to imagine one sprocket + spacer as one layer. 6 speeds mean 6 layers, and 8 speeds will mean 8 layers. 8 layers will be thicker/wider, and thus the cassette width for an 8 speed cassette is more than 7 speeds, which in turn is more than that of 6 speeds. Side view of a cassette. There are 7 sprockets here, notice the spacers between the sprockets. Now, if you have a 6 speed cassette, most likely it fits onto the bicycle rear hub with a thread-on freewheel system. 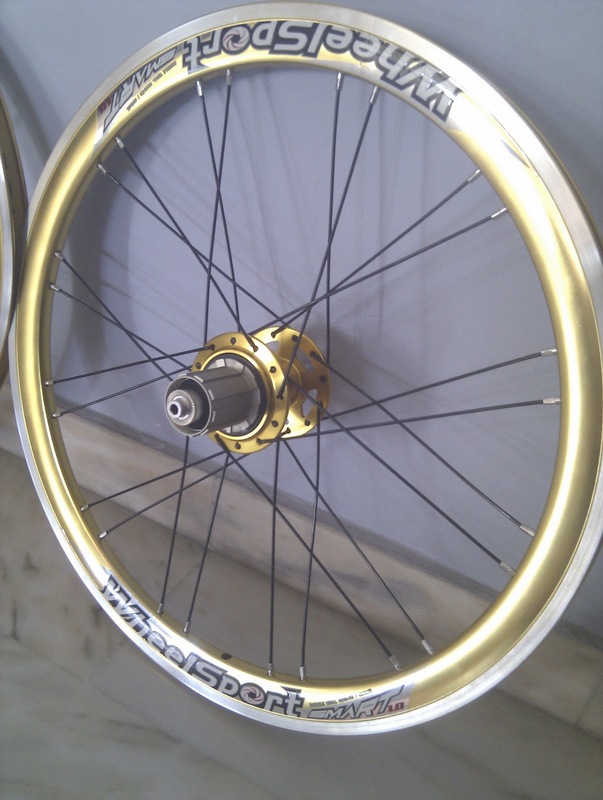 As for 7 or 8 speeds, it can come in freewheel or freehub type, but the more common type is freehub. A 7 speed freehub can only fit a 7 speed cassette, an 8 speed cassette will not fit. Remember, an 8 speed cassette is wider than a 7 speed cassette, and thus will not fit on a 7 speed freehub. Confused so far? More to come! Now, let us look at 8, 9 and 10 speed cassettes. 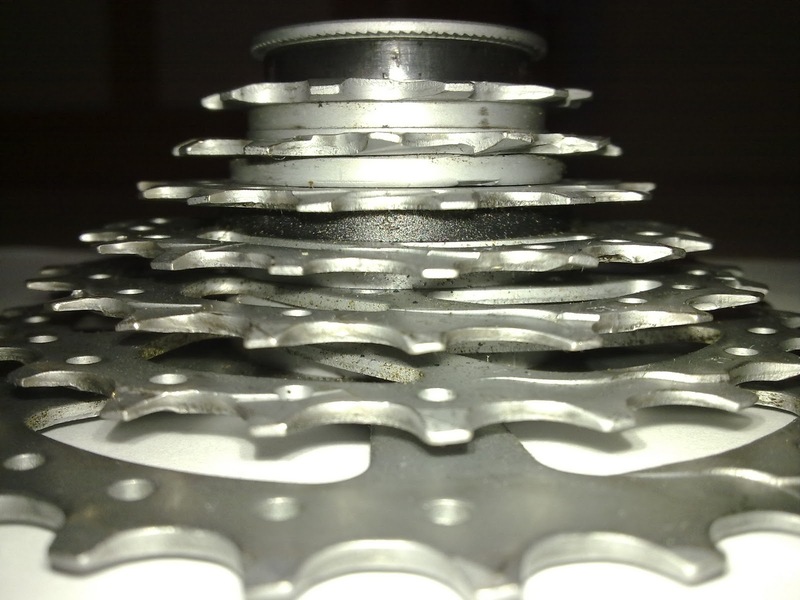 As the number of gear sprockets increase from 8 to 9 to 10, it is not feasible to keep adding more "layers" and making the cassette even wider. Instead, the layers are made thinner, so that you can fit more layers into the same amount of space! Therefore, you will find that a 9 speed cassette actually has the same overall width as an 8 speed cassette. Both will fit on the 8 speed freehub with no problem. 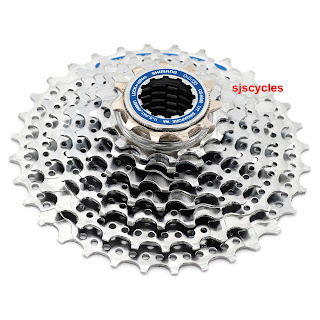 The difference here is that each spacer and sprocket on the 9 speed cassette is slightly thinner than the 8 speed version, and the total difference allows 1 additional gear sprocket to be added within the same cassette width. In some cases, the sprocket thickness may be different, and the overall stack height is compensated with different spacer thicknesses. Confusing, I know. Same story for the 10 speed cassette. Even thinner sprockets and spacers are used, which mean that 8, 9 and 10 speed cassettes have very similar cassette widths, and they all fit on the same freehub. Note that a 10 speed road cassette will require an additional 1mm spacer to fit on the 8/9/10 speed freehub body. An 8/9/10 speed compatible freehub. A 7 speed freehub would be slightly shorter. Because of these different sprocket and spacer widths, the recommended chain for 8, 9 or 10 speeds are all different. These will be explained in the later part of this article, when the drivetrains are analysed. 6 speed Thread-on Freewheel cassette. The 6 speed cassette has 2 less gears than the 8 speed cassette found on the MuP8. This means that most likely the gear range for the Aleoca R2R is less than the MuP8. Also, with less gears to span the gear range, this will make the jumps between gears quite large, which makes it difficult to find a comfortable gear to pedal in. You will likely find the selected gear to be too low or too high to pedal at a comfortable cadence. 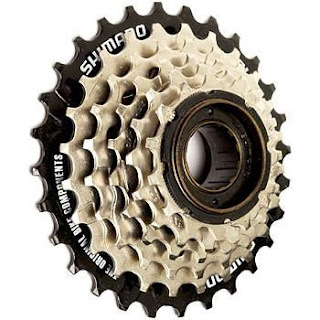 A Shimano Hyperglide cassette will have specially profiled sprocket teeth and wall profiles to help the chain transit between gear sprockets smoothly and quickly. Also, the nickel plated surface will be tough and hardwearing for longer durability. A good cassette's value lies in its smooth gear changes and durability, and it is worth paying more to get a high performance cassette. A good gear shifter is very important in ensuring quick and accurate shifts. When you twist a grip shift, it pulls a fixed amount of gear cable, which actuates the rear derailleur to move the chain. This precise amount which the cable is pulled is carefully controlled, in order to shift gears accurately. This is why we can have an indexed shifting system, where each click moves the chain accurately to the next gear. The shifter determines how many speeds the bicycle can have. You cannot use a 9 speed shifter on an 8 speed cassette, because the cable pull ratio is different! 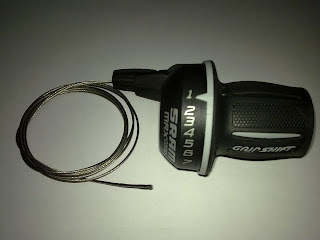 Also, the cable pull ratio for most Shimano components is different from SRAM components, thus it is not recommended to mix and match gear shifting components from different brands. SRAM Twist shifter. The one on the MuP8 is similar to this but is 8 speeds. A well designed gripshift will require less effort to twist and change gear, and will also retain its accuracy over time. If you compare the shifting performance of the Aleoca R2R to the MuP8, you will find the MuP8's gear shifting to be much quicker and crispier, without the annoying sound of the chain rubbing against adjacent sprockets. A good grip shift does not cost much, but is crucial if a good shifting performance is desired. The rear derailleur basically derails the chain from the current sprocket, and attempts to put it accurately on the next sprocket. For folding bikes, the rear derailleur deserves special mention because of its vulnerability to damage, compared to large wheeled bikes. This occurs during transportation in the folded mode, where the rear derailleur may stick out and hit other objects. Also, the rear derailleur should not hang down too low, as it will be vulnerable to damage if it is too near the ground. Theoretically, the number of speeds that a rear derailleur can achieve is not fixed. The movement of the rear derailleur is not indexed, it just moves according to how much cable is pulled by the shifter. Which is why we can find 8 speed rear derailleurs being used for 9 speed systems or the other way round with no issues. You can use a 10 speed rated Ultegra RD with an 8 speed cassette and shifter. The compatibility issue is usually with the width of the cage, where wider 8 speed chains may not fit nicely through a narrow 10-speed-rated cage. Saiguan Rear Derailleur. Very traditional design and appearance. 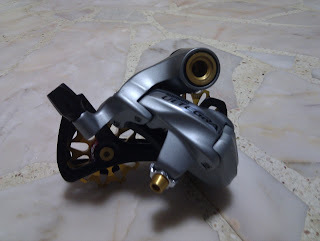 Dahon Neos 2.0 rear derailleur. Quite unique because it is mounted in front of the rear axle. See how well it tucks away under the axle, so that it does not stick out to the side. 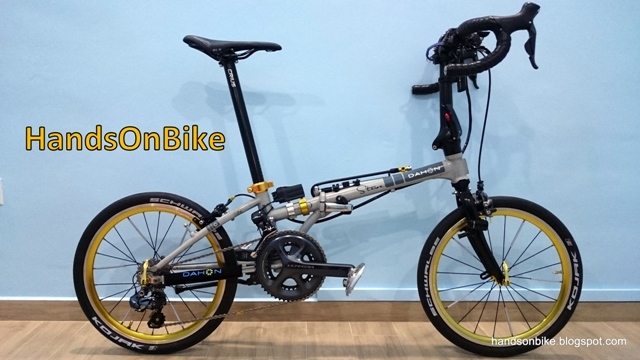 As you can see from the link above, the Dahon Neos RD is really ideal for small-wheeled folding bikes. It helps to tuck away the RD, preventing it from damage. Not only that, I personally find that it performs excellently, with crisp and accurate gear shifting. A good RD will have a rigid construction, so that it does not bend or become misaligned when under spring tension or cable tension. It will also need to pivot smoothly when it is actuated. This enables it to track the sprockets accurately, which helps improve and quicken gear shifting. After comparing the gear shifting systems for the Aleoca R2R and the Dahon MuP8, I must honestly state that although the MuP8's gear shifting system is better, the cost price is not that great a jump over the Aleoca's shifting system. The components used are mostly entry level, with no branded stuff, thus the shifting system is where I feel the increased cost is not fully justified. Nevertheless, the performance of the shifting system on the MuP8 is definitely better than that on the Aleoca R2R, and it may be worth the investment if you like smooth gear shifts that are fast and accurate. Read the previous parts of this article here! agree that the neos derailleur is really good. when mine spoilt after several fall, i got a second hand one instead of a more 'branded' one cos it just works.. and well!!! Changed the shifters on my puP8 though.. not that it is bad but trigger shifters are easier to manipulate, a personal preference. Another great article to read!!! thanks for your compliments! the advantage of gripshifts is that its very easy and quick to shift multiple gears either direction. however, for me personally I prefer trigger because I find it difficult to keep a firm grip on a gripshift when going fast and changing gears at the same time. I just bought my first ever bicycle, Dahon Speed P8 for a month. But now I'm having a problem on my shifter. It jumps or slips to the 6th gear when I shifted to 7th gear. It always skip the 7th gear. and also 1st and 2nd gear is always on the same sprocket. Do you know what is the main cause for this problem? It seems that the shifter cable has stretched and there is insufficient cable tension to index the gears properly. If you are not sure how to adjust it, bring it to the bike shop and let them adjust for you. What to do when gear shifter won't move from 2 to 3 until 8? Too many factors can affect the shifting. Bring it to the bike shop and let them fix it. Hi, could you recommend me any middle range bicycles? Just sold my Aleoca foldable - sg50 edition. I find it super tiring to ride, worst then the rented bicycle I could get at ECP. Thank you! Look for a Dahon or a Tern 8 speed model. Prices start from $500 onwards. 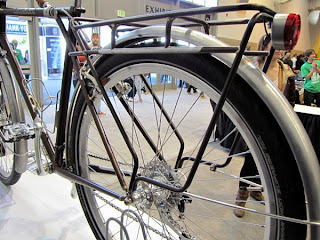 First Look at Tern Bicycles!